A brief guide establishes key argument concepts, including fallacies of argument; appeals to pathos, ethos, and logos; Toulmin and Rogerian argument; and rhetorical analysis. Part 2 focuses on five common types of argument: arguments of fact, arguments of definition, evaluations, causal arguments, and proposals. Part 3 covers presentations, visual rhetoric, and multimodal arguments, to address the full range of media. Part 4 guides students in research for academic arguments, including finding, evaluating, integrating, and documenting sources and avoiding plagiarism. A wealth of provocative examples illustrates argument in the real world, from politics and economics to journalism and media. Short, snappy examples, from #metoo tweets to protest posters, weave in the debates that rage around us. 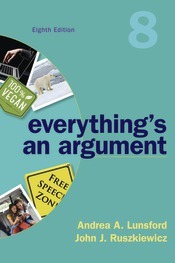 In Part 2, two longer model essays in each chapter exemplify the type of argument.